The new book A Land Full of God gives American Christians an opportunity to promote peace and justice in the Israeli-Palestinian conflict. 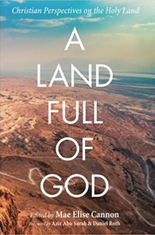 Professor of history and middle eastern studies, Judith Rood, wrote a chapter in A Land Full of God, which released in May 2017. The book includes brief, digestible, and comprehensive essays about the historical, political, religious, and geographical tensions that have led to many of the dynamics of the conflict today. Rood’s chapter is built out of years of her research and teaching world history in the shadow of the Holocaust and tells her particular life story, written as a conversion testimony. A Land Full of God walks readers through a biblical perspective of God's heart for Israel and the historic suffering of the Jewish people, while also remaining sensitive to the experience and suffering of Palestinians. “The collection makes the calling of Christ even more clear to us in our present moment, as we have become more sensitized to the deep abysses between believers, as people and as communities,” said Rood. Other notable contributors to the book include pastor of Willow Creek Community Church Bill Hybels, theologian Darrell Bock, pastor of Quest Church Eugene Cho, former United States Secretary of State John Kerry, and Pope Francis. Purchase the book online. Rood’s forthcoming book, tentatively titled “Between Promise and Fulfillment: A Theology of History,” will be published by Cascade and explores premillennial dispensationalism as a theology of history for those who want to understand God's work in world history.